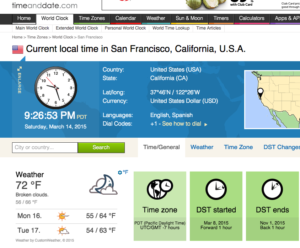 I just watched the online World Clock turn over to 3/14/15 9:26:53, and it was… less moving than I expected. But I did take a screen capture to commemorate the occasion. But all day I’ve been thinking, on and off, about Pi. Because I’ve been thinking a lot about life, and about spirituality, and about infinity. About religion and Religion, about God and god, about the connectedness of all things. I have a theory that religious people and atheists differ only in semantics. Both are trying, in our finite and flawed human way, to get a grip on infinity. Pi is an especially interesting representation of something that we mostly believe to be both infinity and perfection. Take a perfect circle and bisect it perfectly. Then divide the length of the bisecting segment into the circumference of the circle. You’ll get this magical number that never repeats yet goes on indefinitely. It really is a beautiful number. Circles figure prominently in our legends and lore, in our metaphors and our rituals. We use rings to symbolize union in marriage, we have family circles and circles of friends, we discuss the circle of life. Division and union also figure prominently in our lives. Two hands that oppose and complement each other. Two sexes, required to unite for procreation. Yin and Yang, black and white, attract and repel. Marriage and divorce. Pi has this sort of magical place in, around, and through all of this. Pi is sort of the God number. It is perfect and infinite, yet patternless. I know Pi can be calculated in other number bases, but I’m too lazy to look up whether anyone has really studied those to see if they have the same mystical properties as Pi. I assume they do, since conversion from one base to another is pretty straightforward. So it’s not the number itself that intrigues me. It’s the perfection of the ratio of the circle to the straight line that bisects it, in a perfectly mathematical world. But we do not live in a perfectly mathematical world. Our world is imperfect. Our perception is finite. We live in more than two dimensions. In our world, the perfect circle does not actually exist; it exists only in the theoretical, as described by mathematics. I suppose I would say that the same is surely true for the perfect being: a perfect being can only exist in the theoretical, as described by theology. Pi exists where the theoretical touches the physical. We can’t ever know the full extent of Pi because it is perfect and infinite, and therefore in its full and true form it can’t exist in our finite and flawed world. But we take comfort in its existence and wonder at its majesty. We know in our hearts that it is there, that it is bigger than we can comprehend. Next Next post: What does your tattoo signify to you?